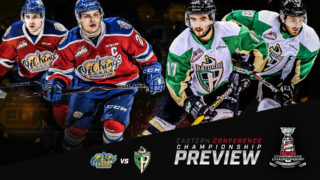 RAIDER REVIEW: The Raiders (13-1-0-0) hit the road tonight to take on the Moose Jaw Warriors (5-3-2-0) at Mosaic Place. Last night at home against Everett, Ian Scott backstopped the Raiders to a 3-0 win over the Silvertips with a 24-save shutout. Brett Leason continued to find the back of the net, scoring twice in the win. Justin Nachbaur added an empty-net goal with 16.7 seconds left on the clock. VS. MOOSE JAW: This is the second meeting of the year between the Raiders and the Warriors. 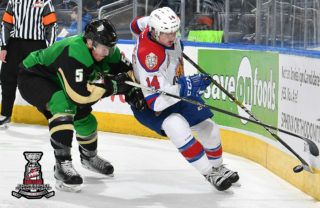 The Raiders erased a three-goal, third-period deficit to take the first meeting 5-4 in overtime in Moose Jaw. Parker Kelly led the way with two goals and an assist. Donovan Buskey earned the win with 11 saves in the Raiders’ net. LEASON LIGHTING THE LAMP: With two goals on Tuesday night, Brett Leason recorded his fourth multi-goal effort in the past six games and has found the back of the next in six of his last seven. Heading into this season, Leason had never put up more than one multi-goal game in a single season. 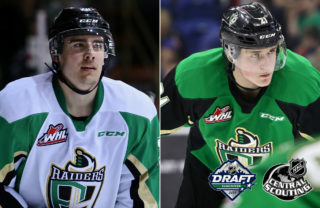 The 19-year-old from Calgary now has 13 goals and 17 assists on the year and is three points away from tying his career high of 33 set last year split between the Raiders and the Tri-City Americans. SCOTT SHUTS THE DOOR: Ian Scott recorded his second shutout of the season and fifth of his career on Tuesday night against the Silvertips. With a 0.949 save percentage, the Toronto Maple Leafs draft pick leads the WHL in that category for goalies with at least five games played. Over his personal five-game winning streak, the ninth overall pick in the 2014 WHL Bantam Draft is sporting a 1.00 goals-against average and a 0.964 save percentage. 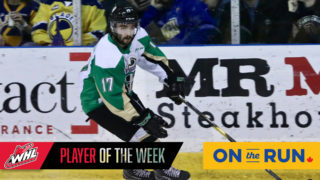 VIPER FROM VITEBSK: With an assist on Brett Leason’s game-winning goal on Tuesday night, Aliaksei Protas extended his point streak to nine games. Over that span, the Belarusian rookie has three goals and seven assists. 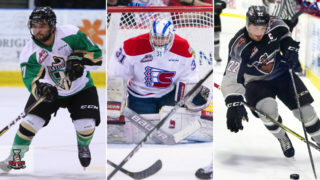 The 2019 NHL Draft prospect has put up four goals and nine assists so far this season, which places him in a tie for tops in rookie scoring. He also has recorded a point in 11 of his 14 games this year. 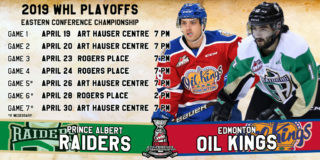 NEXT UP: The Raiders are back at home on Saturday night when the Regina Pats (3-9-0-0) come to the Art Hauser Centre. Puck drop is 7 PM. Tickets are available at raiderhockey.com.